Here’s how Monday turned out. JPY (purple) most bid that session +1.03%. CAD (brown) most sold currency for their session -1.38%. Negative flow that session -4.02%. And looks like a negative day all day (aggregately speaking). EUR (yellow) most bid currency for the day in total +2.05%. CAD most sold currency for the day in total -2.05%. GBP/CHF with the biggest spread between any 2 currencies at 37.66%. This top spread pair is also sitting at 1.3053 right now. Ok. Well, as I articulated a bit about this last time, the EUR did change in the line up against the USD. And well, after calculating, and looking at the chart, I’m in. Long. All things point to this pair going up. But…you know how this market can act at times. So, I’m protected. We’ll see what happens. But, am still in with the top spread pair. Yeah, lost some, but I got my stop loss down at the 1.3000 area. So, I’m fine. Not worried whatsoever (It’s all about how much you’ve risked anyway). And on with the week we go. 3 more days till it’s over. 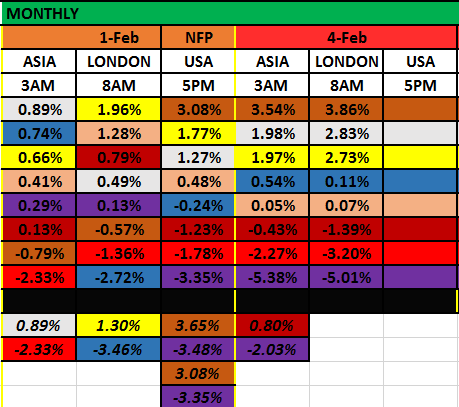 NZD (dark red) took that session +2.21%. GBP (blue) lost that session -1.42%. A bit of negative flow -.86%. 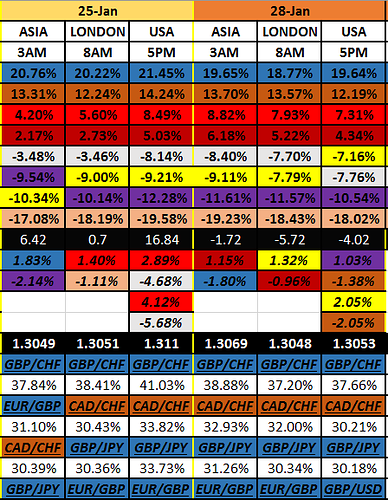 GBP/CHF still top spread trade +36.59% between them. So, what do we got? Well, the NZD changed above the AUD (red) in the line up. Sure, it’s not the end of the day yet, but look back between those 2. The NZD surely came a long way to over take them. And I don’t know what happened to the AUD, but, I would imagine their specific chart must be going downhill, you know? And the GBP. Well, this is the second Asian session that they dropped. Interesting. I don’t know…maybe this is the beginning of something. Oh…wait…they have a vote going on today right? Oh man. Yep. Something’s gonna happen. I think that news result should make this go one way or the other. Like, either they had their run (drop out of the top) or just going much higher than they seen so far. We don’t know. Let’s hold on and find out. I am. And, I did real quick want to mention that it’s nice to see the EUR (yellow) stay above the USD (white) . I think this has potential. Ok. I looks like we will have an interesting day. Let’s see more of Tuesday. GBP (blue) came back from losing the previous session to winning this session +2.26%. Makes sense, their awake now. JPY (purple) lost this session -1.58%. Some good positive flow 5.73%. Top spread pair firing back up there, now +39.96%. The pair sitting at 1.3082. Ok. Well, we see the AUD, NZD, going back and forth intraday. I guess the AUD will put up some kind of fight. But, we’ll have to see the end of day numbers for a little more clarity. But, you have to admit, all 3 Comms are still the most in demand, since the beginning of the year. CAD (brown), AUD (red), NZD (dark red). Yep, the CAD is not letting go that easily. I kind of thought they would have, last week when they dropped down to the 10% area. But nope. We can surmise that the money is still favoring the risk-on currencies. 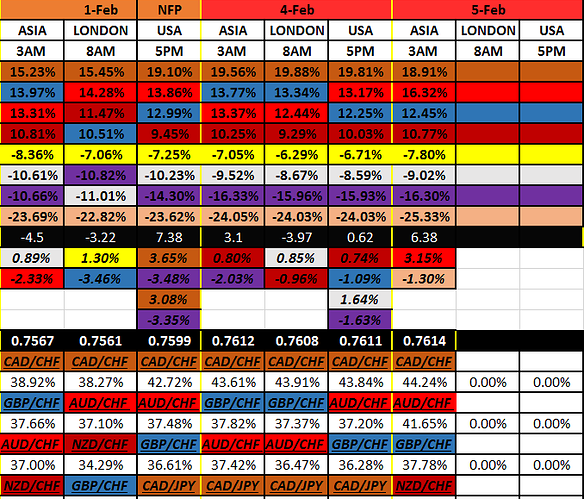 And we can also see that the CHF (pink), and the JPY (purple), are still the favored currencies to be sold. Although, the USD (white) is looking downwards, right? Oh yeah, they still are below the EUR (yellow). But, it is early don’t forget. Hey, this is how trends start. Plus, we are heading towards the end of the month. And I do know, from experience, that change likes to occur sometime around a turn of the month. The market is a forward looking machine. This is the only way to see it. Beforehand. And…by tracking it. Let the fireworks begin (GBP). Things might get interesting. The question would be then…Did the market already price in all that it has? For now? Or, Are we just at the beginning of a longer term trend? That’s the thing. In the market, we will always, always, always, have questions. Know why? Cause we will never know the future in the present time. But, at least we will always find out. Let’s look at the massacre. Tuesday’s final. JPY (purple) took that session +2.14%. GBP (blue) lost the session -4.99%. EUR (yellow) took the day in total +1.70%. GBP lost the day in total -4.15%. 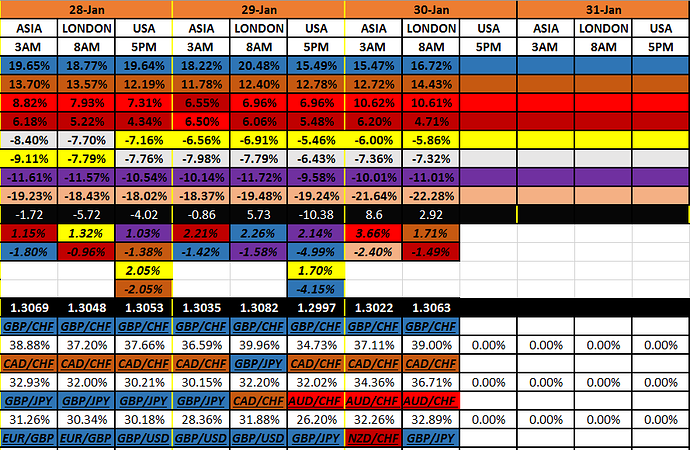 GBP/CHF still the top spread pair at 34.73%. Now sitting at 1.2997. Well, yeah, it wasn’t good. Actually, I’m surprised it didn’t fall much more. Basically went down to the 1.3000 level. And then some. But, don’t worry about me. I’m out. And I’m not getting back in, this end of day anyway. Nope. I have to see how this month ends up before I get in my extreme demand trade. It can wait. My other trade is panning out so far. EUR/USD. So, that’s nice. I know. No real changes to the line up. Other than the NZD gave big brother a run for his money today. But then, backed down. And the EUR stays on top of the USD. Other than that, we have to wait out the GBP. They were so far up there. Maybe this is just a huge retracement…shrug Don’t know. 2 more days to go. Should get interesting. AUD (red) took that session +3.66%. CHF (pink) lost that session -2.40%. Some good positive flow +8.6%. No changes to the line up. 4 up, 4 down. It’s been that way. So, that’s good. Well, looks like the bleeding stopped, for the Pound. The only real GBP pair that kept on going that direction was the GBP/AUD. Now, other than that, the bleeding has stopped. Just look at the top spread pair. It might be a little early to tell, if there will be more selling of them. We will need some more sessions to go by. And that’s why I think it’s important to know what the aggregate of each currency is doing, more than any single currency pair. I’m sure the Aussie traders think the Pound is down and out. But, you have to see that the one currency that is most sold around here is the CHF. Now, everybody is taking their turn with them. Just look at the top 4 spread pairs. All CHF. Ok. We need a little more time. I’ll tell you what major changes come our way. At the moment, I don’t see any. Alright. Keep your heads down. Here’s how Wednesday is rolling out. CAD (brown) took the session +1.71%. NZD (dark red) lost that session -1.49%. Some more positive flow +2.92%. GBP/CHF still climbing higher for the biggest spread pair at 39.00%. Ending at 1.3063. Look at all of the aggregate flows (black line across). Now that we’re coming to the end of the month, we’re definitely having more positive flows that earlier this week. What does that mean? Well, the positives are getting more positive. The Comms (reddish colored) are climbing. The GBP is climbing…after the real good hit yesterday. 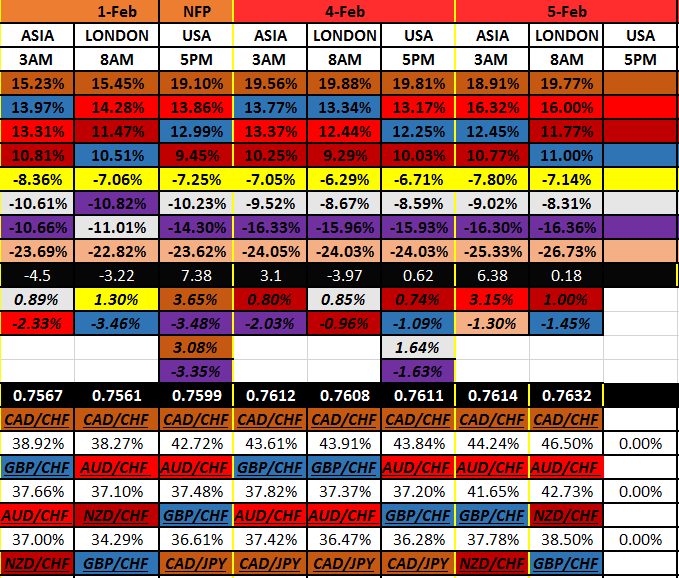 Also, on the bottom, the last 2 (CHF (pink), JPY (purple) ) are staying low. No indication of change. And, so far, the EUR (yellow) has stayed above the USD (white). Speaking of them two. Today should be telling. Cause the FED has their interest rate decision meeting, at 2pm EST. Well, the run up to that has definitely been lower. I believe that is something to be realized. Remember, the market is always a forward speculating machine. Money likes to position itself before events take place. Sure. We can get surprised. That’s always a possibility. But, that’s why the central banks prefer to be opaque, and transparent. They don’t want to see the markets get thrown for a tail spin. They do the best they can to keep things smooth, by talking to us as time passes by. They prefer to let the data speak for itself and let us fight it out in the market, during those high profile economic indicator times. Yeah, like Friday’s NFP. Speaking of that. Maybe it will get interesting. See, not only is tomorrow the last day of the month, for profit taking, but NFP on Friday will also give traders, maybe even the Central Banker traders, a good reason to position themselves one way or the other. Basically, the volatility for the rest of the week can possibly be very high. We must use extreme caution. Everyone will have their own agendas. We just need to follow the big fish. So, I would suggest to wait for whatever confirmation you need first, then act. You just got to be careful about speculating. I prefer to follow. My preferred method, of confirmation, comes down to the line-up. Got to wait for that, right? I’ll see you at days end. Let’s look at the totals through Wednesday. NZD (dark red) most bid currency that session +4.06%. USD (white) most sold currency that session -3.43%. AUD (red) most bid for the day in total +6.26%. USD most sold currency in total -4.32%. 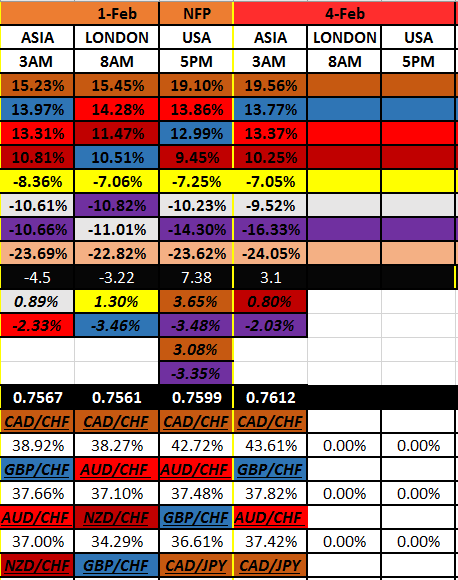 CAD/CHF new top spread pair 38.61%. Now sitting at .7560. Wow. I just checked. The only currencies that ended, this day in total, in the positive was the Comms (AUD +6.26%, NZD +3.29%. CAD +2.66%). Very interesting. All others ended up in negative territory. The EUR was the best of those being -.69%. So, what do we have? The flow continues. All except the GBP. I’m thinking their consensus is not for the up. Sure, the home team wanted it that way, for whatever reason. But, those darn Americans say differently. Well, and how about what happened with our interest rate decision, huh? Nice 50 pip jump…for the EUR/USD. I took profit and that trade, then got back in. Hey…the yellow is still above the white…and continuing the spread. I’ll by that. And well, since we do have a new top spread pair, I got in that one also. Look. It’s no surprise to see this pair back up there. They dominated that first place for a time earlier this month. The GBP took center stage for awhile. 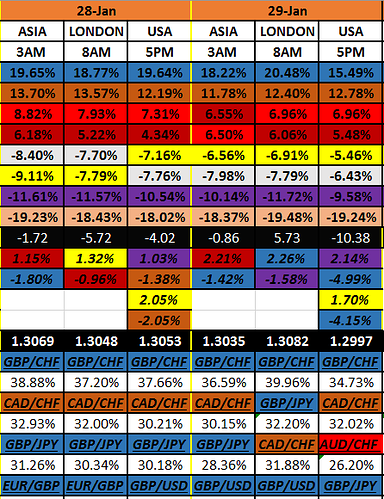 But now, I think the attention of the money has gotten enough of that GBP/CHF pair. Now it’s back on the CAD/CHF. Hey…you never know about that AUD. That AUD/CHF pair looks promising. Plus…13 some percent is not far away from 15 some percent. We’ll see how it shakes out. Well, tomorrow (Thursday) is the last day of the month. We need to be aware of profit taking. So, there is a difference between taking profit in the market and a changing of the trend. One should be much more than the other. Know what I mean? I see it more as a changing of the line up in regards to the trend. And profit taking will entail some losses, that’s all. How’s the last day of the month rolling out? AUD (red) took the session +.94%. USD (white) lost the session -1.93%. Alright. Well, we do have a line up change. The USD has crashed it. It sends them down towards the CHF (pink). And to think, they would have to double where they are to get to the CHF. Man…that’s amazing…how are down the Swiss is. But, that’s how we like it. For how long, do you ask? Well, I can tell you that their central bank is loving this. They probably want even more selling. We have to keep a watch, that’s all. So, again, we got some more positive flow. The only one that didn’t go up was the CAD (brown). But you have to remember that it really isn’t their turn yet. They’ll have their go at it a little later on. Man…I wonder if they have their unemployment data coming out also (?). I’ll check later. Anyway. Running out of time here. The last day of the month is half way over. Let’s look at it. JPY (purple) took that session +.89%. CAD (brown) lost that session -.81%. About a break even flow -.02%. We have some changes taking place. At the top. The 4 currencies in the positive. Looks like the AUD took the reins. Of course we haven’t hit end of day yet, but, well, look with your own eyes. Sure does looks telling. 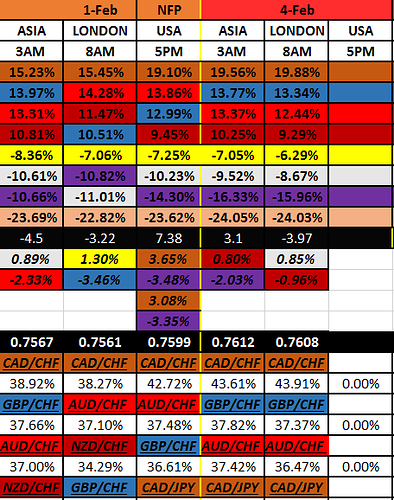 I mentioned that yesterday, about the AUD/CHF pair. And here they are. We’ll have to reserve judgement till end of day. This is just a heads up, know what I mean? The attention that went to the Pound has been lost. The good thing, though, is that the attention has stayed with the positive running currencies. I thought, since the end of day results yesterday, that the CAD would have stayed on top…but they’ve dropped over a percent so far today. But, to get a better picture, we’ll have to see what they do now that they are waking up and their big banks will have their shot. Will they be bidding it? shrug We’ll have to see. Remember, end of day is most important. Looks like the NZD (dark red) is gunning for it, also. Seems like they want to be up there next to big brother. Usually they are. But, you have to admit, that 0% dividing line stayed true…separating the men from the boys…The bid against the sell…Positives against the negatives. (You got the point). The one thing that kind of scares me (just a little) is the JPY (purple) has been taking a bid today. Like I mentioned yesterday, there is a difference between the end of month profit taking and a change of trend. Well, so far, I think this is more of profit taking than a change of trend. As I have always spoken of, you can see some changes finally taking shape, here at the end of the month. I think it’s traders (we’ll call it money) that is positioning itself for what they want to see up and coming next month. A new start. But, at least it’s keeping with the broader trend. Which is the Comms on top, and the safe havens on the bottom. And then within those 2 camps, I believe the AUD is elbowing his brothers out of the way for the top. Looks like end of day might make me have to switch to another top spread pair. We’ll see. I always make my decisions in the last hour of the day. Oh, and you have to admit, I got on the boat with the EUR/USD trade. Well, so far so good. We’ll see where that one wants to go. I would love to see the yellow (EUR) go up to the 0% and cross it over. Come on Dragi…say something good, huh? Beeeee careful today. See ya at the end. CAD (brown) took that session +1.68%. EUR (yellow) lost that session -2.47%. AUD (red) most bid currency for today +2.42%. EUR most sold currency today -2.87%. CAD/CHF took the top spread pair 40.12%. Sitting at .7576. Well, what do you know. The CAD woke up. Their traders brought that back on up, huh? But, it was the AUD that took the day. It’s just that the CAD was already up there in the clouds. So, it didn’t take a whole lot for them to keep the reins. I mean, look how far that AUD/CHF pair came! I guess this needs to shake out. The way I see this, money is all over the Comms. All three of them. I can’t tell which one is favored. I mean, the AUD took the last 2 days in total. That’s over 8 1/2 % in 2 consecutive days. Pretty impressive. And given that it’s at the end of the month, I’m thinking most of the attention belongs to them. Not to say that money doesn’t want to go to the CAD. Not at all. All I want to know is who is the most favored. It’s just too close to tell, with these Comms. Well, for one thing, if you’ve been selling the CHF (pink) you’ve got to be in good shape. No signs of veering off that, at the moment. And what happened to the EUR today? Boy, they took a hit. Look. They took both Monday, and Tuesday, in total. Then to lose most of that. Something is going on, and I don’t know what. They ended last Friday, end of day, being -9.21%. Popped up to around -5%, now back to where they started from. Oh…I remember…This week was the roller coaster ride thanks to Brexit shenanigans. And the Pound cooled off also. Well, tomorrow, for sure, will be the tell. I think that if there’s a chance for them, it’ll happen after NFP time. Look at the spread between them and the Swiss. That’s amazing to me. It shouldn’t be like that. Look. Who am I…A complete nobody. So, please, don’t mind when I talk out loud like this. It really means nothing. All I do is notice these things. That’s all. The Swiss are doing what they want to do, and the EUR is doing what they are doing. Maybe they did part ways. Trust me, it never used to be this way. Times are changing I guess. Ok. I’m done talking that nonsense. Let’s get ready for a brand new month. And if you dare, I got some new stuff coming. Please don’t look at my excel sheet now. You won’t understand it. I’ll clue you in as time passes. Have a good night and see ya in the am. Let’s look at Friday, the start. 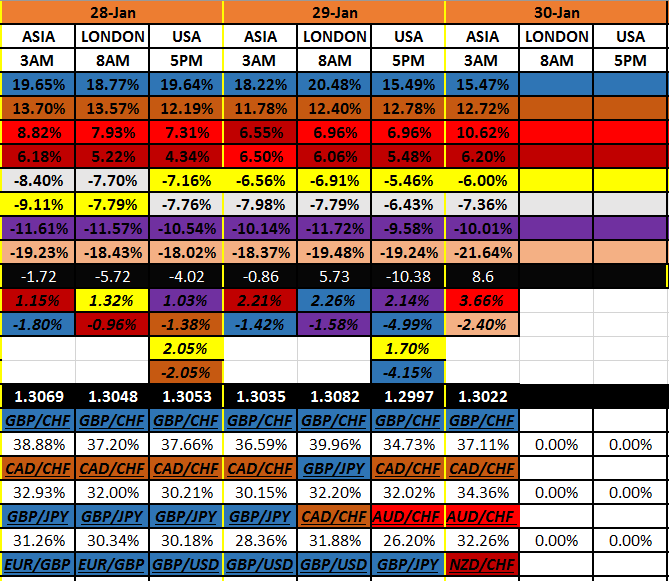 USD (white) most bid currency that session +.89%. AUD (red) most sold currency that session -2.33%. Got some negative flow -4.5%. Well, technically, it is a new month. I’m going to continue to keep track of these continuously running, but also I will keep track of them strictly on a monthly basis also. I won’t show both in here, you can see for yourself on my excel. It’ll be below this table. The only thing I find interesting, here, is how this was a complete opposite of yesterday’s first session. It flipped flopped. Man…I’m glad not to be in the market. Who knows what’s going to happen today, for the week out. We’ll I’ll have more time to talk later on today. Wow. Sorry this is late (hopefully someone notices). I’ve been extremely busy. Between my new system, and NFP, placing a trade…etc. Well, this is how Friday is panning out. EUR (yellow) took that session +1.30%. GBP (blue) lost that session -3.46%. Wow. That’s a lot. Anyways. That’s nice, I know. Well, as I have articulated this before (at around the turn of the year), I will be having more than one context. Why? Because I want to see which context is more telling than the others. So, that means I have to keep track of a couple things. What’s the yearly total running percentages? What’s the quarterly running percentages? What’s the monthly running percentages? Look. I’m sorry. I want to know. But, don’t worry, I won’t be putting all of that up every time. It’s for me. But, I will be mentioning only the very interesting, and important things that I would see. That first context will tell me who’s most in demand, down to the least, as the year unravels. In total. The next context will tell me how the quarter unfolds (every 3 months). The last context will tell me just how the month takes shape. And see, I can size each of those 3 different contexts up against each other. We will always have the end of month profit taking. Along with the end of quarter profit taking. And of course end of the year. I will have to think, as this all unravels, which one to use as the report (the picture I take for in here). In any case, you’ll always be able to see all the work in my excel sheet, which I always put at the end of these posts. Well, I will be tracking this. And as you can surmise, all my contexts’ are based on time. More specifically, as the calendar is unfolding. That’s what I deem most important. And look. This is only one context. I’m not necessarily right or wrong. It’s just the angle I choose to view the most in demand currencies. I’m sizing them all up in this fashion. That’s it. It’s my particular edge. And, if you don’t know it by now, there’s credence given to those who are in more demand tend to stay that way for a length of time, until that changes. We’ll call that patterns. Here’s the week for ya. CAD (brown) took that session +3.65%. JPY (purple) lost that session -3.48%. CAD most bid currency in total today +3.08%. JPY most sold currency in total today -3.35%. CAD/CHF top most spread between them 42.72%. Closing the week at .7599. Well, what do we got. Boy, it was all about the CAD today huh? Oh, that’s right, it was Oil that did it for them. I guess they do have that in their corner. Ok. Well, they didn’t get up there overnight, right? I think it’s interesting that the Comms took a dive today. shrug What was it? Profit taking? Probably. And the GBP got a boost that session, but lost for the day. Just a little bit though. The EUR got a good boost today. Still above the USD, even though the USD had some bid because of NFP. Well, I tell you what I think. I went against the grain today. Normally I would put on the top spread trade a little bit before the end of the day, week. But, nope. Not today. I do not have a good feeling with the Swiss. Just look at the entire month of Jan. You know they’ve hit rock bottom. Man, I can’t see that continuing on. Also. The spread between them and the EUR is frightening for me. I mean, look, this could be a new era. Sure. I’ll buy that. But, I won’t put my money on it, right now anyway. Unless they separate continents and live farther away from each other, I will always view them as close partners. And. If you would look at them at what happened today, they’re not too far apart. You can view this on the excel sheet, it’s just down farther from this long running one. I’m just gonna sit it out for a little bit of time and see how next week rolls out. I’m patient. But, I’m not going to jump in on that top spread pair, just yet. I think it’s going to change. I think the weak currency will be changing. I don’t think it’s going to be the Swiss. These are just my reasons for not getting into that. That’s all. It keeps me on the sidelines. I’m sure for not longer than a week. We’ll see how it plays out. But, I do have my EUR/USD change trade running. I’m just gonna sit on that for a while, till I see a change. I’m done talking…for one week. NZD (dark red) took the session .80%. JPY (purple) lost that session -2.03%. Well, I don’t have any time this morning. The bottom is taking up way too much time for me to do. So, the very, very bottom table is not completed. See you little later on. Here’s how Monday is taking shape. USD (white) took the session +.85%. NZD (dark red) lost the session -.96%. The flow took an about face, -3.97%. Well, no line up changes, so far. But, what I see so far today, is the USD is climbing. It’s been the USD, CAD (brown) show. They both have been the bid currencies since the open. Actually, the EUR (yellow) has been on the bid side, also. So, you got to remember, this is been a result of what NFP has dropped. And sure does look like the Dollar has responded accordingly. From what I remember, the employment figure beat expectations. But there was some other not-so-good data. I guess we can say that it was mixed, but on the good side. It’s just something to remember, and might be what is driving the Dollar somewhat higher. And what else…the Pound is not dropping out of the picture, just yet. I had in mind (wrote down) that if they would drop somewhere below 10%, that it would maybe be something to sell. But…nope. Not yet. The GBP is supported. I will just throw this out there for ya. I am taking this perspective into account also. Cause I want to know. This is the month all by itself. As a beginning. The USD (white). Catching a bid. You can see it with your own eyes. The Comms (reddish colored) have been a sell, since NFP. The JPY (purple) has been a sell. The CAD (brown) has been a bid. The CHF (pink) has not dropped a whole lot. In the ball park with the EUR. Actually, all of the European currencies are close together. It’s a perspective. I will keep that in my back pocket. And be aware of. That’s all. NZD (dark red) took that session .74%. GBP (blue) lost that session -1.09%. USD (white) took the day in total +1.64%. 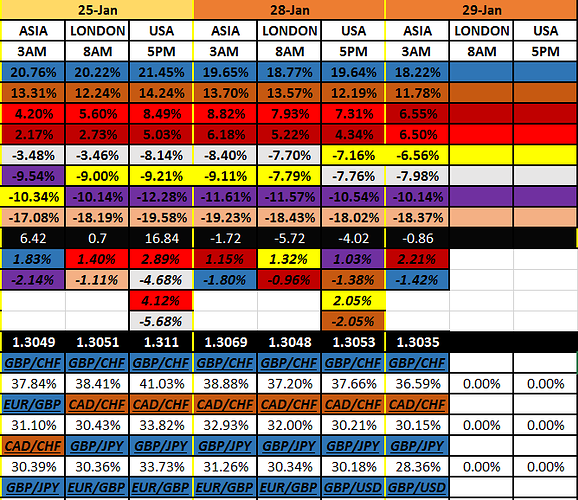 JPY (purple) most sold currency that session -1.63%. Well, it was both the AUD (red) (+.73%) and the NZD for the most bid currencies that session. But, for the AUD, that only brought them back up a good bid. Down for the day though. The NZD came out on top for the day, though. So, basically, it was a buying of the Dollar and a selling of the JPY today. I’m not seeing any real changes taking shape. It was a normal, calm, Monday. We’ll have to see what the rest of the week brings us. Have a good night, and I’ll see ya in the am. Here’s the beginning of Tuesday. AUD (red) took that session +3.15%. 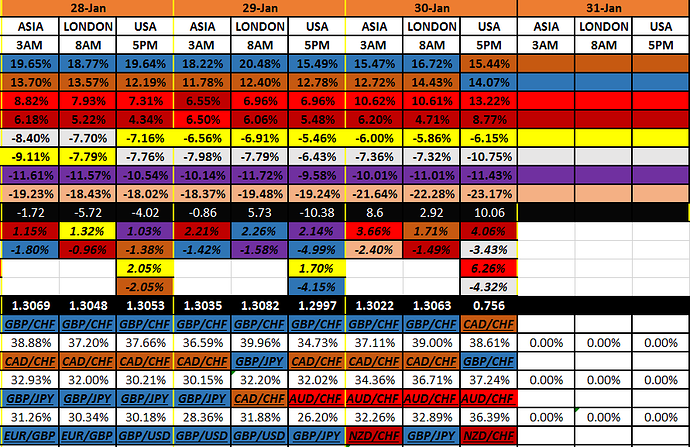 CHF (pink) lost that session -1.30%. The CAD (brown) was the only currency to have gone against their respective flow. Interesting. And I think we should know why the AUD got such a boost. They had an interest rate decision. Not really a surprise to me. Let’s see if they can hang onto their winnings today. Or, did they blow all they got? Unless you took some large timespan, processed years of data to see what’s dynamic behavior of relations. Laws in random events tend to surface only when then number of experiments tend to go to infinity. While you are trying to predict what’s the next coin flip based on past outcome. Let’s look at some Tuesday. NZD (dark red) took the session +1.0%. GBP (blue) lost the session -1.45%. CAD/CHF still the top spread pair 46.50%. At .7632 now. Well, everything’s relative. And it’s common sense that no one can predict what’s going to happen next. That’s a given. And that’s why all humans can go on is patterns, to follow. But, I want to prove this one and only statement. What is, is what is, until it changes. Let’s look at the most recent data, up there. 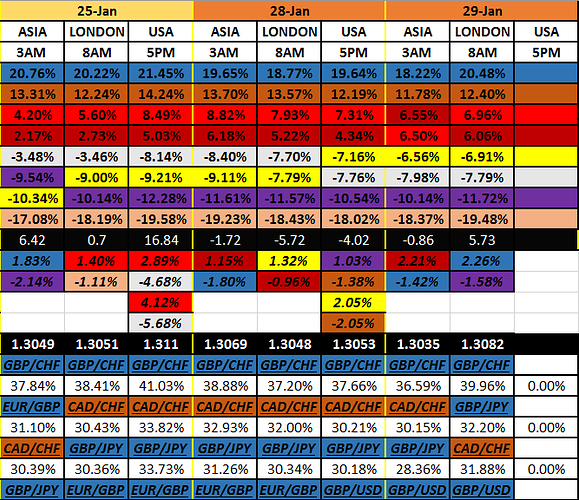 The CAD (brown) is still the most bought currency of the year. I could have predicted that statement with some confidence. 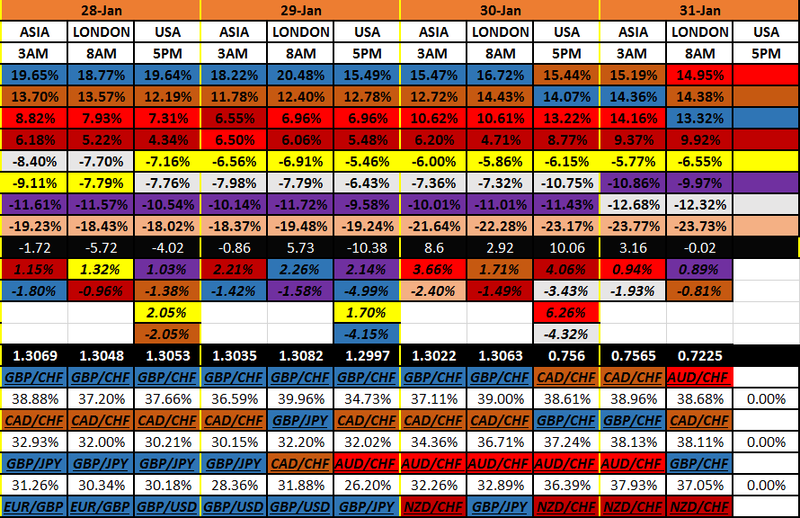 The Comms (reddish colored) aggregately are more bought than any other grouping of currencies, this year so far. Could have predicted that also. 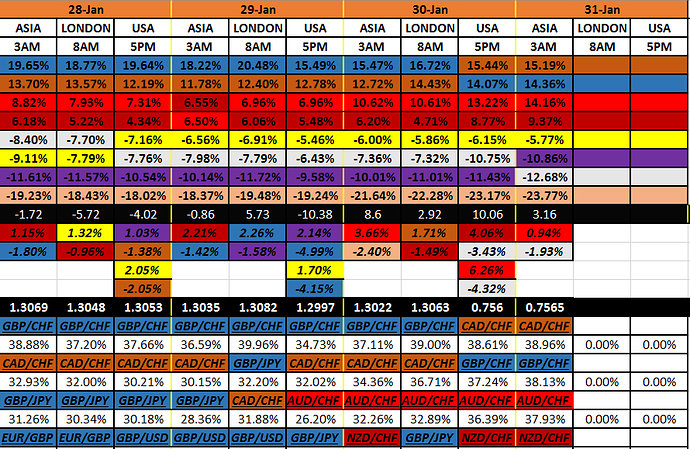 The CHF (pink) is the most sold currency this year. Same thing. No one currency, up there in the line up, has crossed above or below the 0% line, since the last session (meaning would have gained or lost that amount). Could have predicted that with some confidence. 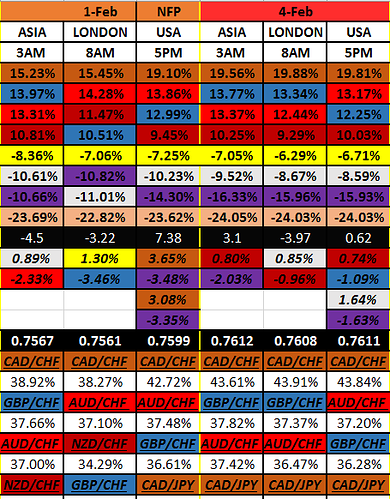 The CAD/CHF pair is still sitting with the largest spread of a difference between any two currencies. According to their running totals for the year so far. Could have predicted that with much confidence, since last session. Look. Again. Everything is relative. All I’m doing is showing trends. Sure, we can’t predict exactly what, how, something will do in a specific time period. That’s why it’s best (in my opinion) to follow a trend, or a pattern. Thanks for bringing this up. You make a very good point. I think that’s nothing but the elephant in the room. Like, no kidding. I mean, are you trying to find some predictive thing that tells you what’s going to happen? Like, an indicator? Or maybe a leading indicator? I have. For years now. And guess what…you’re not going to find what you think you want. If the whole entire market is in the business of looking forward to where price will go, and placing their bets on it, then what makes you think you’ll find an indicator that will tell you it’s gonna get it there? That’s the job of economists, and central banks. Their jobs are to put all past data together and come up with preemptive solutions to their problems. Like where inflation will be in the future. So they can curtail their interest rates. Well, it’s a hard job. And that’s why they want to look at the market, see where price is at (in the bond market), and factor that into their calculations. The markets are the best indicator. Anyway. This is the game. Nothing can be predictive with pinpoint accuracy in the way that you seem to be looking for. Once you understand that, only then can you proceed on to finding your own way of exploiting a profit out of the market. And if you do find a better way…God bless you. But, for me, it’s more than just making money. I want to know how the market moves. Why it moves the way it does. Where it moves to. How these currencies are relating to one another. Maybe that’s the difference between those who get into the market…solely for money…or because you just love it. This is what it looks like, to be a trader.